On an early Monday afternoon, the Fairgrounds Coffee and Tea in Bucktown is crowded with customers. Nearly every table is occupied, leaving only the barstools closest to the counter available. It’s hard to get comfortable in a place like this, especially when the rest of the restaurant’s menu reads like another language, and it becomes your responsibility to know which not-so-obvious yet cleverly-named coffee grind is a dark or light roast. Conversations are overpowered by the baristas’ sporadic yells, clinks of utensils tapping ceramic plates and fast-typing fingers on keyboards. And yet, amidst all the noise, Yomí seems unbothered. The Chicago singer and harpist, who strolls through social media as That Harpist, sits across me. Her pink cotton candy hair – which compliments her sparkly oversized sweater – pops out from the shop’s patrons, who have cozied up to shades of gray. A tiny, thin ring forms half of a halo around Yomí’s button nose and reflects underneath the fluorescent lights. In Greek mythology, muses traveled with their harp, or lyre; that stringed instrument, though delicate and soft, soothed turbulent seas and protected fleets of soldiers from harm. That same energy wraps around Yomí, who speaks in revelations and unveils a smile after epiphany. “The main thing for me is love and light.” Yomí lives in the present and is at peace. But there’s another side to her that reveals a set of truths. And without this side, Yomí cannot fully exist. The 24-year-old Barrett pulls on her sweaters’ sleeves and stretches them over the tips of her fingers and brings her hands closer to her face. Barrett, originally from the west suburb of Oak Park, is a product of the Chicago Academy for the Arts and a classically trained harpist. And those who grew up with Barrett knew she and her harp were inseparable. But it was more than just thinking she was too cool for her harp. She was tired of playing second fiddle to it. In Barrett’s mind, fleeing to Philly proved to be the only viable option to pull away from that identity; she already had an open invitation from her friends, who moved from Chicago to Philadelphia for school and in need of another roommate. What she didn’t foresee was a tidal wave of unexpected challenges that would unravel a couple months after her big move. She called those artists her saviors. Without question, they welcomed her and provided her something to sleep on. All she had to do, really, was blend in and be down for the cause. Again, Barrett found herself alone. 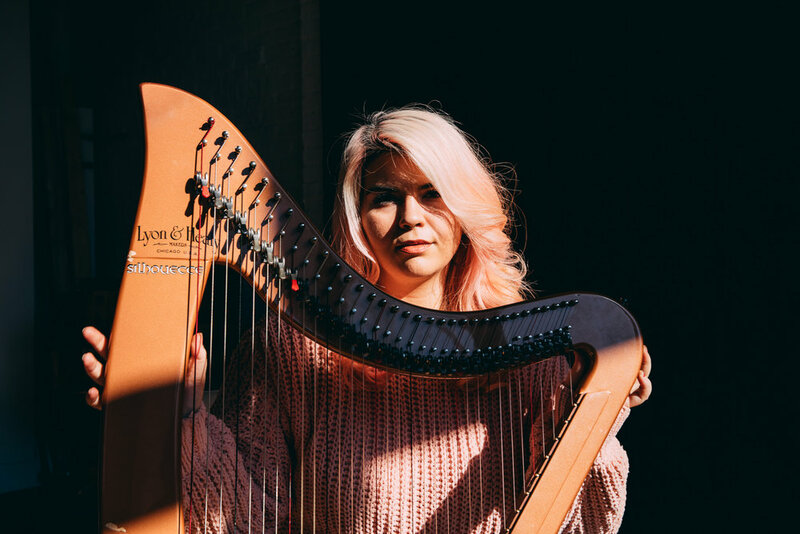 Reuniting with her stringed instrument brought on a realization: Barrett and her harp didn’t fit into Philadelphia’s punk scene. “It was just like they were super supportive, but it was not the scene for me.” They were misplaced, and she knew it. It was time for them to return home. “I could have stayed there and been a completely different person – and maybe would have been OK. It was just a choice. I needed to put myself first. At the end of the day, no matter how much you love and how important everyone else is in your world, you have to be the No. 1. So, Philly showed me to do that. Embracing that admission gave birth to Yomí, leading Barrett into realm of serenity, femininity and wonderment. Yomí formally introduced herself to the scene in 2017 with her mixtape, #ThatHarpist, but she reflected on an earlier project that marked her blossoming. 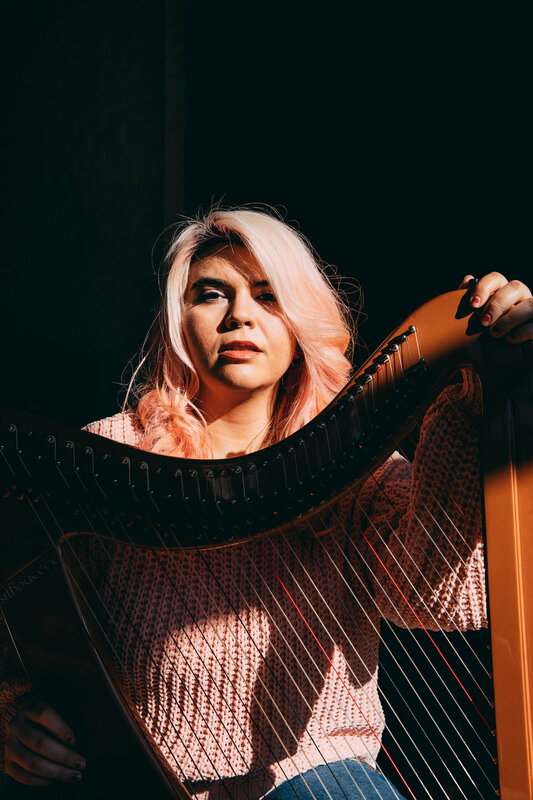 Love Songs for the Universe embodied the essence of Yomí, not only as a harpist but as a an artist, singer-songwriter and producer. Yomí breathes in acceptance and exhales gratitude, leaving behind a trail of creative endeavors and crafting a sound influenced by a different set of classics – jazz, blues and R&B. Sprinkles of features and collaborations with other Chicago musicians like MFnMelo, Blake Davis, L.A. VanGogh on Soundcloud, as well as an EP Goodbye Autumn, are a peek into her evolution. She isn’t quite sure what the future holds for her, but she knows that whatever it is, it’ll be good. If there’s anything that meditation taught her, it’s to exist in the moment. Everything, right now, is a work in progress, and every move matters.